Pakistan latest batting prodigy, Babar Azam has said that he should not be compared with Indian batting maestro Virat Kohli. Azam who is currently at Pakistan training camp for the West Indies said that the two batsmen are pretty different. “I am different and Kohli is different. My focus is on delivering for Pakistan and thats my main objective. The teams atmosphere was and still is very good,” said Azam, quoted media reports. Azam informed that the team is focused on improving their ODI rankings, which at present is placed at number eight. “Meanwhile, as a team, our focus is to improve our rankings in the ODI format where we are number eight,” he said. 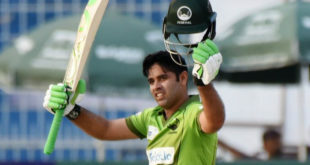 The middle order batsman informed that he is also working on his bowling apart from facing other bowlers in the training nets, and shared his desire to play as an all-rounder in the near future. Babar Azam much like to his older cousin Umar Akmal is regularly compared with Kohli. Earlier Umar Akmal said that he should not be compared with Kohli by insisting that their batting positions were different. He added that Azam should be compared to Kohli as they bat in the same position.